[Original Software] EMail Sorter – Tool for sorting emails from office365, godaddy, gmail, yahoo etc. You load an email list, then the sorter will auto check the email’s mx record, then check if the email is hosted by office365 or gmail or yahoo, and write the emails into different txt file. hello, i need the email sorter … how can i purchase from you ? I would like to buy the sorter for 3 pc license. Please i need this sorter, how can i make payment, and how soon will i get the sorter software? if u use macbook, u can use vm. Hi can it work offline? If i load a domain which is powered by gmail will it be sorted out also or only @gmail.com emails??? how do i purchase this? i have d v1.1, do i have to pay again to get v1.2? It would be nice if we can add our own mx records. I sent you a mail. did u use other email address? What’s the duration of this licence?? How do i pay? How much is the email sorter and email fetcher? what is your icq id? I need this email sorter too. i am so happy getting a response from you, How do i contact you? How long does the license last or does it last forever ? Please assure us about this and let it be so too. can you add zimbra domains too?? Want to buy full version ..
After it finished sorting you can’t view the emails that is been sorted, why is that? what is your skype id? please how much is the email sorter for 1PC and do you sell licences gammadyne mailer. Please kindly get back to me ASAP. Hello i will like to buy this software but can you email me your skype so we can do the transaction there. Thank you. How much and how do i pay? Bitcoin or PM let me know urgently. Hello, i want sorter.. What is your ICQ ID? I need email sorta for 2 pc how much will it cost me? SO HOW DO I PURCHASE MAN…….AND HOW DO I ADD ON 3 PC? The trial version gave me a funny result, In the sense that it extracted well but the emails came out coded. I want to purchase sorter pls kindly reply my chat on icq..
bro how do i remove or download the sorted emails from the software. Or i need to to buy a full version because i was using the trial version. Is the new email sorter price also $100? Which also features these domains 1and1, mimecast, hinet, synaq, mweb, chinaemail, zmail, yizhigher, coremail? Can we have a software which will enable you to srrbit URL by submitting the email dormain or email? SORRY FOR THE ERROR, I HAVE BEEN HAVING CHALLENGES ON HOW TO GET A DORMAIN LOGIN PAGE I TRY MAILTESTER,MXTOOL ETC .. ALL I WANT TO KNOW COULD IT BE POSSIBLE YOU BUILD A SOFTWARE THAT WILL SHOW U YOUR EMAIL LOGIN PAGE? I am interested in the email sorter and i have sent you an email and texted you on whatsapp and ICQ. please reply me back ASAP so we can transact???? hello your email is blocked friend , i send you message to skype please reply me . why cant this tool check for duplicated emails ..
please i need this software but i need hotmail,outlook,comcast and att email address added. I need the email sorter v1.4. kindly give me your contact on ICQ, Skype and email. How do i get the trial version of the email sorter to please..
i need email sorter license for 1 PC bro. I downloaded your trial version and after sorting, all the emails were rearranged with asterics (**) how do i remove the asterics. how can i recover mine? i purchased but my laptop has been formatted so lost the file. how can i get it back? How do i get one for just one PC. and how much and how to pay? i want to buy a license for this email sorter kindly tell me the procedure to make payment and how i can get my license delivered to me. your id skype and icq id please…I need the mail sorter. how much is email fetcher for 1 month? this sorter has zimbra email ? what happens to those of us that has Version 1.3. When are we getting the free upgrade? why will you ask for money to get update? when are we to expect an update. please add more email servers to be sorted. can the email sorter software separate private domain emails according to their email host? and how much is it? 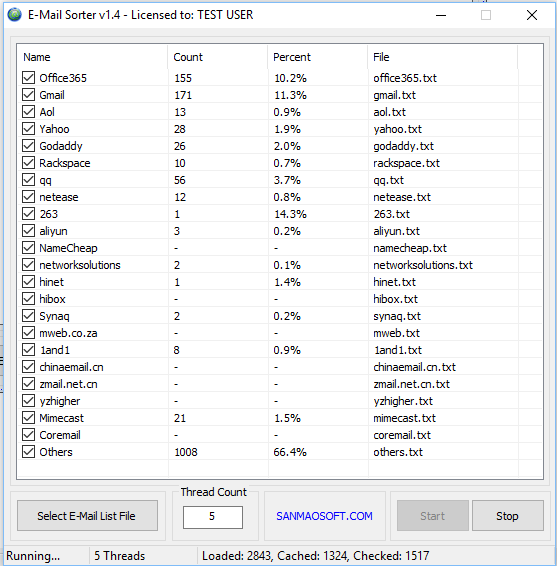 sanmao on [Original Software] EMail Sorter – Tool for sorting emails from office365, godaddy, gmail, yahoo etc. Testino on [Original Software] EMail Sorter – Tool for sorting emails from office365, godaddy, gmail, yahoo etc.